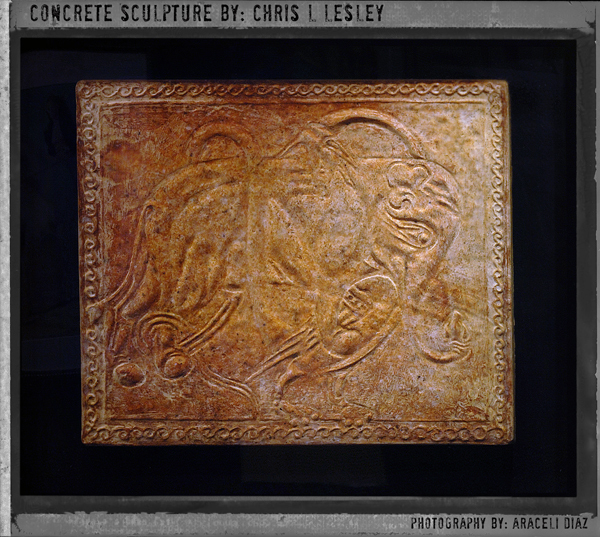 Artwork done by Chris L. Lesley $4480. There are several relief an sculptures that depict elephants and dragons in South America to Mexico. Here is a representation of a play, two people in costumes one is of a greater reptile the other is very similar to the India temple reliefs with elephantine heads. This relief was found during research for other sculptural reliefs unfortunately my source is lost for the moment, making this a mysterious piece indeed. Artwork done by Chris L. Lesley $3710. THE DRAKONES INDIKOI were a race of gigantic toothed serpents that inhabited India preying upon the elephants. In many cultures there are sculptures and reliefs of greater reptiles preying on, or battling elephants. 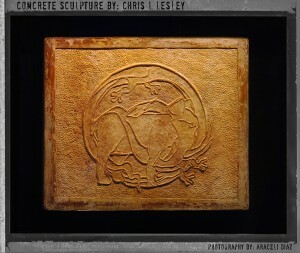 This design is very consistent and traditional to the original painted manuscript, now a 3 dimensional relief. A decorative design along the border has been added for design purposes. This sculptural relief of an elephant and an Indian Dragon was inspired by an image from the Aberdeen Bestiary manuscript. This bestiary now resides in the Aberdeen bestiary library 1200 A.D. Artwork done by Chris L. Lesley $5100. Angkor Wat is a temple complex at Angkor, Cambodia, built for the king Suryavarman II in the early 12th century as his state temple and capital city. As the best-preserved temple at the site, it is the only one to have remained a significant religious centre since its foundation—first Hindu, dedicated to the god Vishnu, then Buddhist. The artwork you see here was inspired by this temple complex. In some sense this image is a collage of different scenes that reside from this temple. In the details you will see a battle going on with people horses and elephants which is from one part of the temple the stegasaurus carving is from another section of the temple. At least two very significant books testify to the authenticity of the stegosaurs carving.: . . . . .
2. The large, beautiful 320 page book, Angkor, Cities And Temples, by the same author and photographer, includes a half page picture of the stegosaur sculpture. On page 213 the author describes it as “an animal which bears a striking resemblance to a stegosaurus”. This sculptural relief was inspired by the temple at Angkor Wat and was Modeled in clay first, then a silicon matt was poured from that, then concrete. 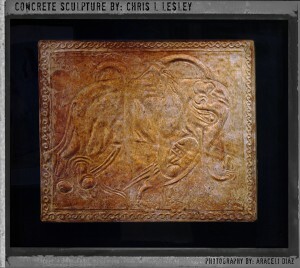 Artwork done by Chris L. Lesley $3425. A dragon attacking an elephant trying to kill it with its coils. A Circular Design originally with one dragon. I took the liberty to add a second for design purposes. The original was in manuscript form full color painting now turned into tablet or temple relief sculpture. 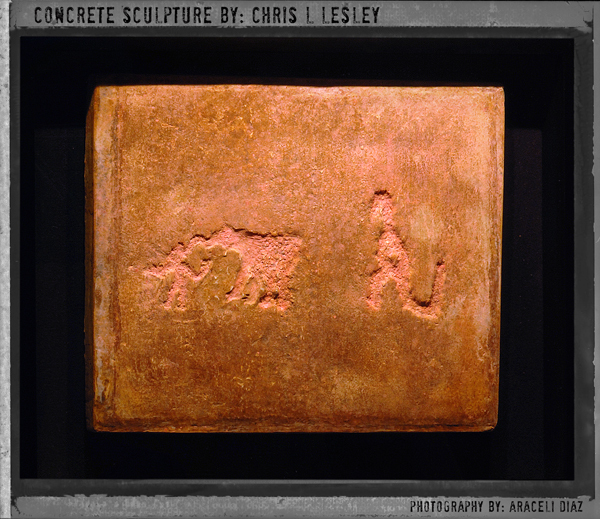 This sculptural relief was inspired by the “Harley Bestiary”, Harley MS 4751 Folio 58v. The bestiary now resides in the British Library. Artist unknown possibly originating from Salisbury England. Rock-Art of a human, elephant, and a dinosaur has been found on a cliff face from the Grand Canyon. How the original petroglyphs were made: The red sandstone contains a trace of iron. This iron, through the alchemy of unknown ages of time, forms a thin black scale on the surface of the stone, locally called the “Desert Varnish”. By taking any sharp point, such as a piece of flint, and cutting through this black surface, the red stone is revealed underneath, thus making a picture, without the use of pigment, which is practically imperishable. The petroglyphs were found at Havasuapi Canyon in northern Arizona also dinosaur tracks and fossils are found abundantly in the canyon. It should be noted that a series of human footprints with dinosaur footprints have also been well documented in Tuba City Arizona. On the same wall with the dinosaur pictograph, and about 15 feet from it, we found a pictograph representing an animal which was evidently intended for an elephant, attacking a large man. The elephant is striking the man on the top of his head with its trunk. The wavy line represents water into which the man has retreated up to his knees. Both arms are upraised and the fingers are visible on one hand. The other hand holds something, the form of which is too vague to be determined. Because there are no tusks indicated our surmise is that it is a cow elephant. 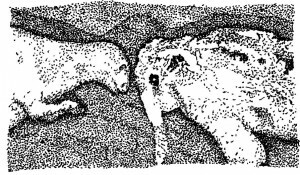 The Havasuapi Petroglyphs were discovered during the 1924 Doheny expedition. Date of the carvings unknown in spite of the many incorrect attempts and methods. What all 5 look like: . . . . . .
Each are encased in a shadowbox, behind glass and require two hundred pound hangers which will all be included at sale. Gallery ready, these are unique and all follow a theme of Elephantines with dinosaurs interacting, and being captured by ancient artist from around the word. Artwork done by Chris L. Lesley $6750. “The Confrontation” shows a dinosaur-like creature in head-to-head combat with a mammoth. These images were carved into the walls using some of the natural configurations of the limestone as part of the anatomy. This dinosaur is in a combative stance. 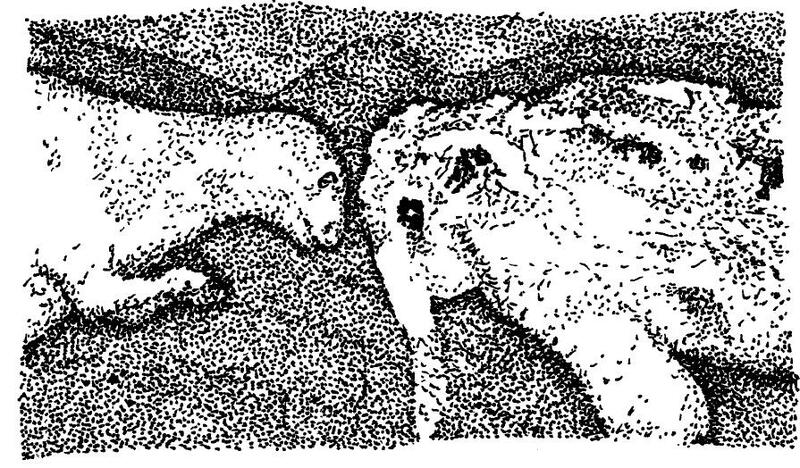 Carnivores tend to be combative, but some herbivores are also combative. However, only Saurischians had a hollowed area in front of the eye. We may also infer from the short upper limbs that this was a bipedal dinosaur (walked on two hind legs). From these features it seems possible to tentatively classify this dinosaur sculpture into the suborder Theropoda. There is also the red hand print on another wall. These undoubtedly are red ochre. Supposedly. all the cave paintings in the Upper Paleolithic made use of this material. What is important is that here is this red substance again. The same kind of material used on La Ferrassie I and Pech del’ Aze in their burial custom. 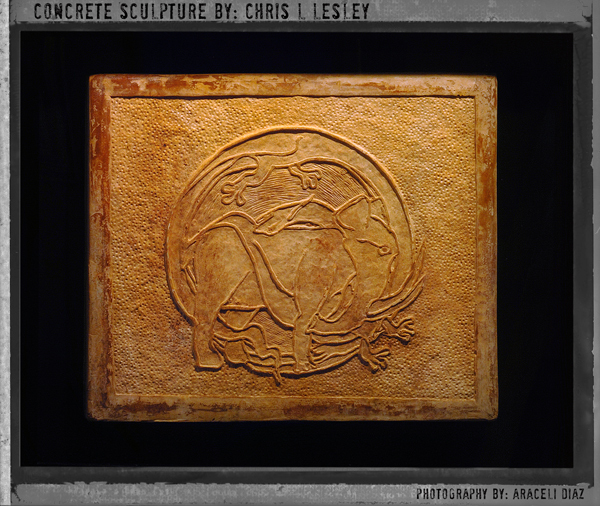 This sculptural Relief was done based off 2 dimensional photographs. The Original Cave Sculpture was done in the Bernifal Cave in France. Only one photo exist of this sculpture and it is widely unknown. I hope that you enjoy this piece and that it brings you a sense of wonder and amazement as the study of the original “Confrontation” has me. Information can be found on the Confrontation,…. in the book. The Granby Stone: During the summer of 1920 during the construction of a pond-size reservoir A man named Bud Chalmers. While dumping a load of earth from a horse drawn scraper he noticed an unusually heavy stone that had been sculpted. A woman named Lela Smith took 3 photos of the stone, If this school teacher had not taken these 3 pictures the knowledge of this would have been lost. An outsider to Granby Colorado named Henry F. Knight convinced Bud that this stone needed to be in a museum, and he paid $300.00 for the stone. Knight donated the stone to a museum back east and the stone was never seen again. The Chinese writing was from a dialect over 1000 years old. The symbols mean: North, River, Fruit, and Fish. There is a Ice age Mammoth on one side, and a Dinosaur on the other and a pre-Chinese Buddha figure that may be the origin of Buddhism. There is also a 3rd hand on the top of the head that may be for people passing by to rub for good luck. The original stone has been hidden or destroyed but the message of the ancients is still here thanks to the photos. Because of these photos I was able to recreate this mysterious artifact for others to see. This sculpture was done from the only 3 pictures of the stone in existence and was the first piece in the series to be completed. 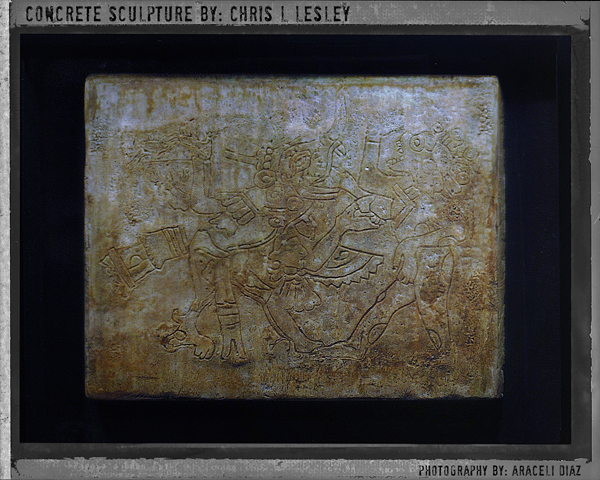 Artwork done by Chris L. Lesley $645. 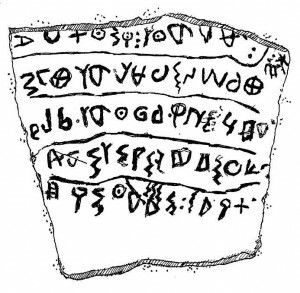 A 3,000 year-old inscription discovered at a site where the Bible says David slew Goliath has been deciphered, showing it to be the earliest known Hebrew writing. 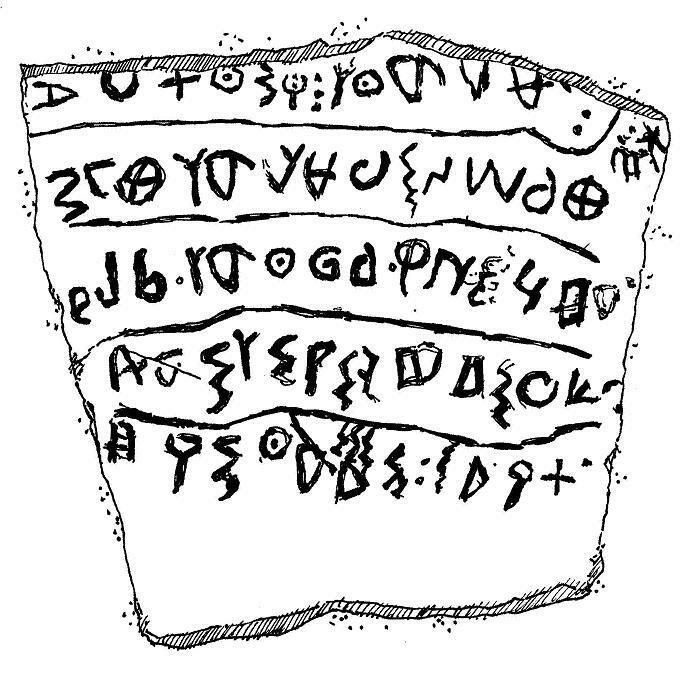 The pottery shard with five lines of text in the proto-Canaanite script that was used by Hebrews, Philistines and others in the region. 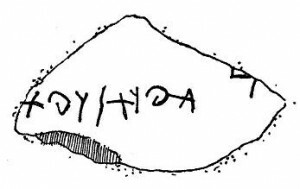 The shard was found near the gate of a site known as Elah Fortress, about 30 kilometres (18 miles) west ofJerusalem, in the valley where the battle between David and Goliath is said to have taken place. It translates: The cursing of the Anak against the servant of God has judged the dead man i have judged Goliath David is his master, the victor i rise up and together we raise up a King i raise up the people of my servant justly. 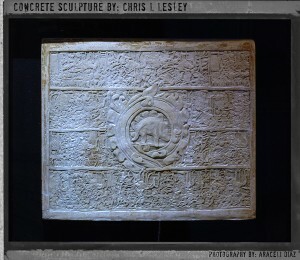 Artwork done by Chris L. Lesley $198.95. Copper coin found 114 feet under ground in Illinois. The thickness of a silver dollar and etched with acid, The figures bear a close resemblance to rude drawings executed on birch-bark and rock surfaces by the American Indians. But by what advanced means were they etched? And by what advanced means was the uniform thickness of the copper produced? the object had passed through a rolling-mill, the cut edges gave further evidence of the machine-shop. ‘All things considered,’ it was said, ‘I can not regard this Illinois piece as ancient nor old (observing the usual distinction), nor yet recent; because the tooth of time is plainly visible. Professor J. P. Lesley (might be a relative if mine?) thought it might be an astrological amulet. He detected upon it the signs of Pisces and Leo. 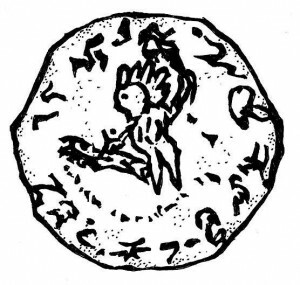 The coin while boring a hole 180 feet a coin comes up from a depth of 114 or lower, a coin of extreme age and a testimony to an advanced culture and Greater Technology. The Largest Stone Pestle in the world. Found in Lovelock Texas in association with native tales of giants. In the cave where it was found numerous other giant artifacts of high sophistication like nets, and baskets, sandals, and skeletons. The largest pestle in the world is far too large to be practical for any single person to use, and is a sight to behold. Advertise greater ancestry with the victory cry, Viva la devolucion!!! Wear it to school or work, buy some for your friends and family. Spread the revolution that is devolution. The cutting edge is here, be the start of a greater science not the out-of-date 19th century failures that are still being perpetuated today. can’t give any more than that away right now….
. . . .much, much, more will be made available in the immediate future.